It wasn’t long ago that our spies spotted upcoming facelift versions of the Audi A4 and A5 Sportback. Now, the upcoming 2020 A5 Cabriolet has made its spy photo debut, with a prototype sporting similar styling changes to the refreshed A4 and A5 Sportback. While the convertible looks out of its comfort zone being tested in snowy conditions, Audi needs to make sure it can cope with all weather conditions. 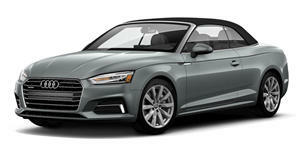 The camouflage applied to the front implies the A5 Cabriolet will get a revised fascia with a new grille and bumper, as well as reshaped headlights. The headlights appear to be full LED units, and the grille will likely get the same 3D design shape as seen on the flagship Q8. At the back, the refreshed A5 Cabriolet features newly designed graphics on the taillights, and the bumper will look more aggressive with new squared-off exhaust tips. We don’t get a look inside the cabin, but we’re expecting the A5 Cabriolet facelift to get Audi’s new and updated MMI infotainment system. As for engine options, the current A5 Cabriolet is powered by a 2.0-liter turbocharged engine paired with a 7-speed dual-clutch transmission that sends 252 hp and 273 lb-ft of torque to all four wheels via Audi’s quattro AWD system. We’ll have to wait and see if the facelifted model gets any engine updates. Don’t expect the updated A5 Cabriolet to break cover any time soon, though. Audi is more likely to reveal the updated A4 sedan and Avant first, so the A5 Sportback and Cabriolet facelifts probably won’t be unveiled until later this year or in early 2020.